Erard Pro has created a new outdoor enclosure, Stormer, aimed at the large-venue projector market. The IP56-rated unit protects against dust, climate and vandalism, and is thermostated, heated and ventilated. A large turbine combined with a heating system ensures projectors will operate in all seasons, even in extreme weather conditions. Stormer is available in two sizes, L and XL, which cover almost all high-power projectors up to 20,000 lumens (5400W). The projector is placed on a sliding shelf which opens entirely for ease of installation or maintenance of the projector. There are filters on both sides of the enclosure that are easily removable. Other features include two IP65 locks to prevent theft, space to install a player inside the enclosure and lifting rings for easy installation. Arthur Holm has combined the functionality of Dynamic3, which houses a computer screen, and Dynamic Talk, which houses a gooseneck microphone, into the new Dynamic3 Talk multimedia conference solutions. This creates a flexible working environment: the user can keep their work surface totally clear of any obtrusive elements, and then have access to cutting-edge technology when desired at the touch of a button. Additionally, users can work with the screen in different positions: it can rotate 180º, can be positioned at a 20º tilt or flush on the table, and can be recessed into the desk oriented upwards or downwards. Lifting the screen activates the elevation of a tray where a keyboard and mouse can be placed. Dynamic Talk 3 contains two Dynamic Talk microphone units: this means that one display can be shared by two conference attendees. The mics can be raised and lowered independently. As well as providing a lift system for gooseneck microphones, it also includes a LED ring at the base of each microphone which changes colour to indicate the audio status. The unit is compact and is described as being very easy to install. It is locally or remotely controllable, and fully compatible with third-party control systems. RS-422 I/O with individual addressing enables the control of up to 30 daisychained units connected with Cat5 cable on a single bus. Remote diagnosis of the units is also possible. Building on more than a decade of experience, the Cable Cubby Series/2 enclosures from Extron offer enhanced aesthetics, faster installation and improved serviceability. The modular design features an integrated hidden clamp system, which secures the enclosure to the furniture surface without tools or additional parts. The low profile lid is damped for smooth, quiet operation and provides a full-width cable pass through when closed. They also accommodate Extron’s updated Retractor Series/2 variable speed cable retraction modules, which now have variable-speed control with more than 50 steps of adjustment for cable retraction speeds between 1.5 and 4 seconds. To meet the increasing demand for ‘stylish yet robust’ floor stands, B-Tech AV Mounts has launched a range of flatscreen stands that includes options for mounting screens in a back-to-back format. The stands can mount screens in landscape or portrait format. They consist of black powder coated bases that provide a solid foundation for two poles, to which the screens are mounted. Each stand comes with B-Tech’s Torsion Tilt mechanism for easy screen adjustment and cable management facilities for a tidy installation. Each stand has three height options: 1m, 1.5m and 2m and a choice of either black or chrome for the poles. The BT8551 is made for medium/large screens up to 50in and weighing 35kg. The BT8552 is designed to mount two medium/large screens in a back-to-back format and supports screens up to 50in and weighing 35kg. The BT8553 is built for large screens up to 65in and weighing up to 35kg. Finally the BT8554 is the largest of them all and is designed to mount two large screens in a back-to-back format, supporting screens up to 65in and weighing up to 35kg. In response to demand for ever easier and quicker installation, Chief has introduced the ConnexSys videowall mounting system. Developed after working with dealers and installers who provided feedback on available videowall options, the new system offers quick install, ease of alignment, easy access and the rigidity to maintain adjustments. The mount has 80mm of depth adjustment to accommodate crooked walls without transferring damaging stress from the wall to the display. Strut channel installation quickly aligns an entire row. Six points of alignment in the PowerZone area reduce the time needed to find adjustment knobs by moving around the display. The RapidDraw display release system gently and remotely pops any screen out for easy access and can be extended 340mm for service. Rigidity prevents accidental screen shift from occurring and keeps the mount from sagging when extended. The new range of projector mounts from Vogel’s is designed for the latest generation projectors weighing up to 25kg. The range includes basic projector ceiling mounts and height adjustable kits with telescopic poles. All mounts come with a universal projector interface. This is equipped with fine tune adjustability for precise alignment to the projection surface. Once aligned, the projector stays in position. Turning the friction ring will eliminate all play from the interface connections, making the mount a solid and stable solution. The height adjustable projector ceiling mount kits can be used when the height of the ceiling is not known or when flexibility is wanted. These mounts come in three lengths offering variable height adjustment from 400mm to 1,350mm. This projector ceiling mount is suitable for mounting on flat and inclined ceilings up to 90°. The CIS Cable Inlay System runs the full length of the pole and even allows for cable routing after installation. According to Peerless, the DS-VW795-QR (see main image) fulfils a requirement for a full service mount to support displays at the top end of the size range. Designed for displays up to 95in, it enables installers to offer clients a complete package with these panels mounted either on wall or recessed into the wall, in both single screen and videowall configurations. The quick release function enables the display to be articulated away from the wall with a simple push release, for quick and simple servicing. The carriage extension force can be adjusted to compensate for the weight of the display and can be locked to prevent unintentional access. Whether used as a single, standalone screen, in either portrait or landscape orientation, or as part of a larger videowall array the 8-point micro-adjustment ensures that any display can be quickly aligned to its surroundings or to the screens alongside it. 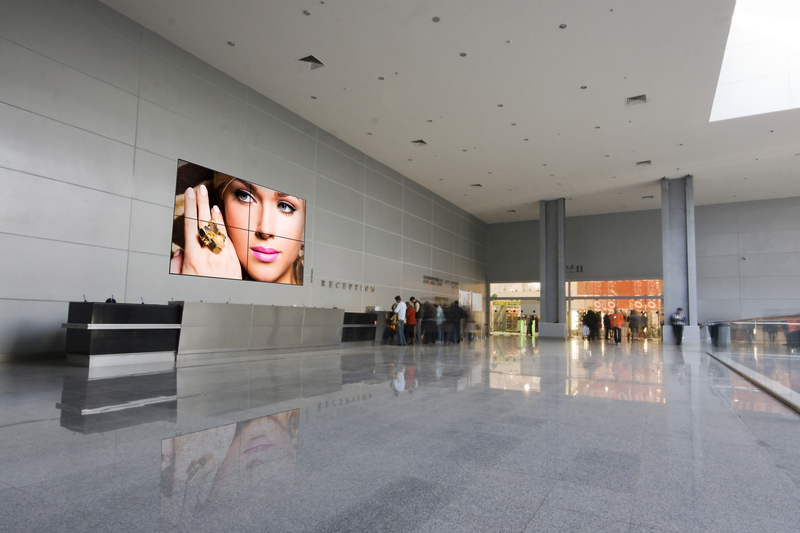 Due to the size of these displays any misalignment will be exaggerated, so the ability to easily adjust the pitch and roll is a vital feature to overcome uneven walls and other common installation challenges.